It is a surprisingly nice and calm summer day at Søre Sunnmøre, by the outermost islands of Western Norway. While off-piste hippies are still skiing on the very last summer snow further in the fjords, the kayak season has already started out here, in a silent bay close to Fosnavåg. But it is not all peaceful. A buzzing noise is heard from above; a massive drone is flying systematically along the shoreline. By the shore, a man is standing with seaweeds to his knees, holding in his arms a rack taller than himself. The man is marine biologist Kasper Hancke from the Norwegian Institute for Water Research (NIVA). He is here to photograph a section of nature that most of us usually don’t see – the zone between the low and high tide. – Usually, when we are mapping the tidal zone, we do the registration manually: Spiral wrack, bladder wrack, knotted wrack, toothed wrack, and so on. But now we try, for the first time, to take pictures from above instead, says Hancke. – When the drone flies 100 meters above the ground, it takes pictures with a 3 x 3 cm resolution. This offers 1,000 times better image resolution, or one million times more data points, than satellite images, which often have a 30 x 30 m resolution. Hancke is convinced that drones are the future for mapping and monitoring of nature and natural resources. When the drone flies 100 meters above the ground, it takes pictures with a 3 x 3 cm resolution. This is 1,000 times better than a satellite, which takes pictures with a 30 x 30 m resolution. – Each family of seaweed has its own colour signature, which the software recognizes. This is due to the combination of wavelengths reflected by the different types of seaweed. Each family gets its own finger print, expressed in colours. The software recognizes the seaweed’s fingerprint, and thereby categorizes the elements in the picture. Identification by colour is called multi spectral image analysis, which is able to distinguish between different groups of seaweeds. Hancke is optimistic that future analysis involve so-called hyperspectral-image analysis, which has an even higher resolution of colours. The drone photos can then be used to identify the precise amount of each single species of seaweeds, mixed kelp forests, and calculate the amount of epiphytes on the seaweed surfaces. 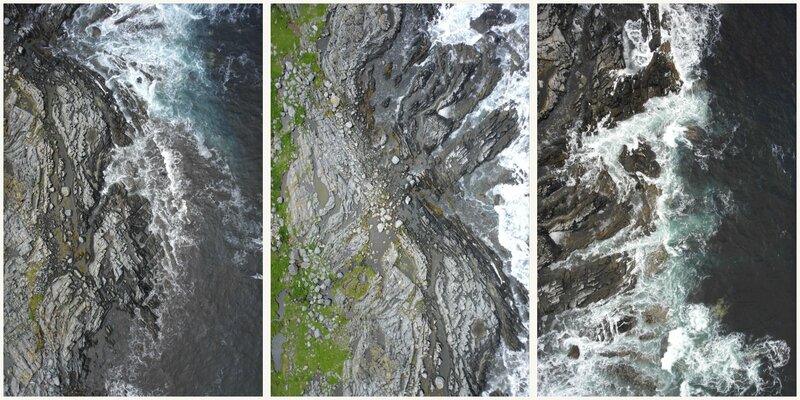 NIVA tested different drone types during their mapping of the intertidal zone at Søre Sunnmøre, Norway. A rotor drone is seen to the left, whereas the drone to the right is a fixed wing drone. NIVA researcher Kasper Hancke and drone pilot Robert Poulsen from Spectrofly company to the right. 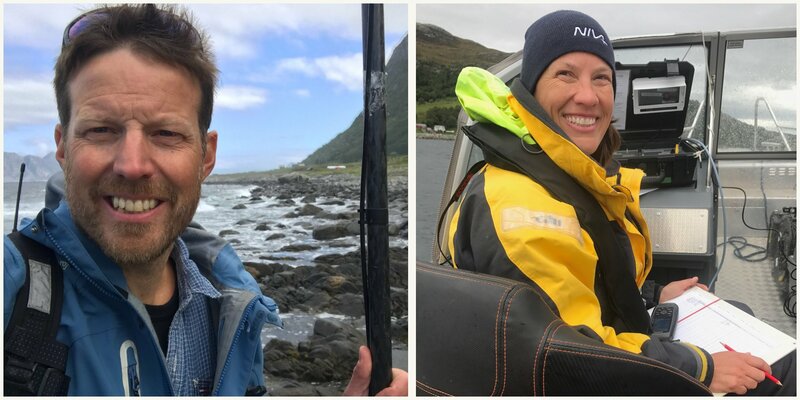 It is not the first time that NIVA scientists are balancing along the shores at Søre Sunnmøre. One year ago, Hancke’s colleague Trine Bekkby was here to map the littoral zone for Artsdatabanken (Norwegian Biodiversity Information Centre) and the EU project EfficienSea. She found both toothed wreck, oarweed, sugar kelp, tangle, and red algae. In June this year, she came back and continued the work one level up, in the intertidal zone. She did traditional mapping – with camera and note book. As Bekkby had already mapped the distribution of seaweeds in Søre Sunnmøre when Hancke searched for a drone testing site, it made the decision easy. 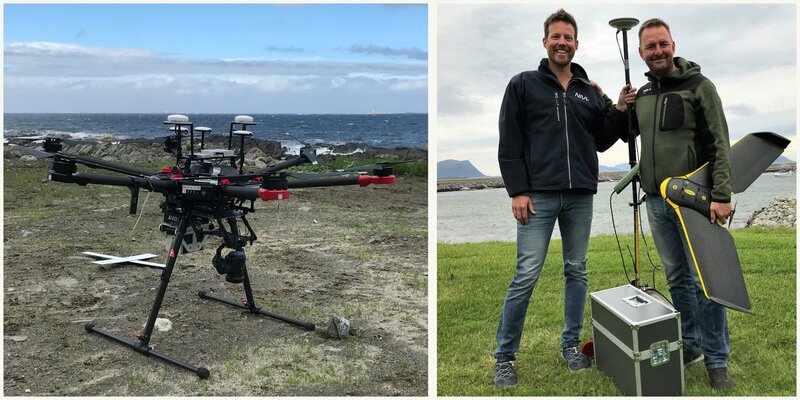 By using her seaweed registrations from Søre Sunnmøre, he can now validate the drone pictures, and improve the machine learning algorithms. Marine biologist Kasper Hancke (left) at the Norwegian Institute for Water Research (NIVA) says that drones are the future within nature resource mapping and monitoring. Senior researcher in NIVA Trine Bekkby (right) is collecting data on the distribution of seaweeds in field. Bekkby’s field data is used for validation of Hancke’s drone pictures from the same area. Two rooms to the left from Bekkby’s office at NIVA, sits Hancke. He pictures a bright future for drone mapping, which will be a lot more efficient and cost-saving than today’s mapping methods. Drone mapping also provides continuous observations along the shores, instead of single data points that need to be extrapolated, like now. In the future, Hancke also wants to use drones for taking underwater photos from the air, not only photos of the exposed intertidal. Cameras that are adapted for underwater photos are not yet on the market, but NIVA has developed their own special equipment for this purpose. – Further, drone pictures can be used to monitor the expansion of introduced species, like the pacific oyster. We are also working towards use of drones for quantification of plastics and marine litter in the coastal oceans and along the shores, and are developing automated image analysis routines, Hancke finishes.